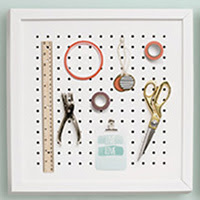 I recently got my hands on the new Organization Gallery Pegboard from my generous friends at We R Memory Keepers, and was so excited to incorporate it into my craft room. 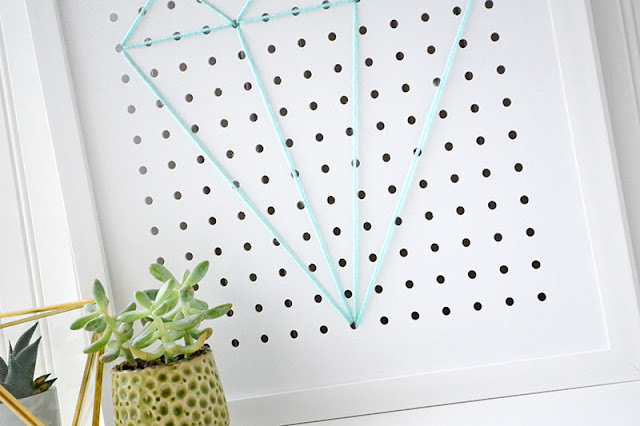 The pegboard is designed to hold your craft tools and supplies, and it's a great craft storage piece. 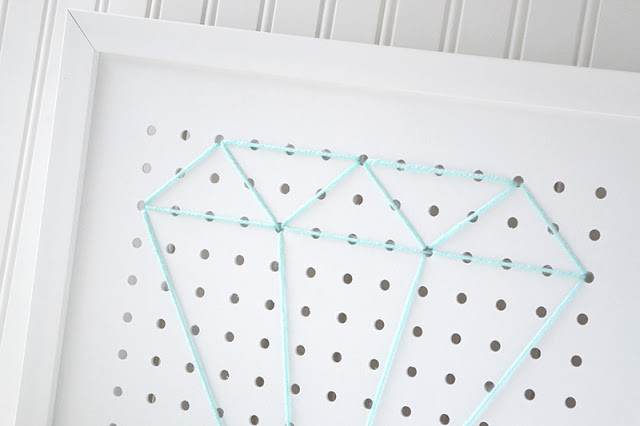 But, I decided to think a little outside of the box, and saw it as a chance to create some DIY string art as a piece of craft room decor. With some minor adjustments, this framed pegboard was the perfect canvas for my diamond string art. 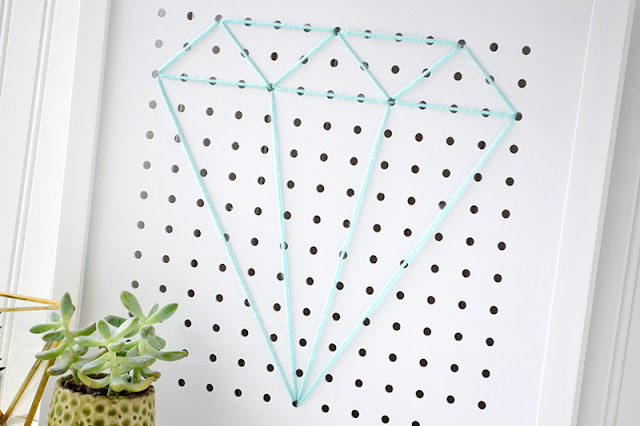 I decided to use a soft aqua color yarn instead of string, so it would better match the scale of the Organization Gallery Pegboard. Plus, my craft room is full of aqua and it's my favorite color, so it worked out perfectly. In order to "stitch" the yarn through the peg holes, I had to remove the backing of the frame. That was easy to do with my craft knife and a steady hand. 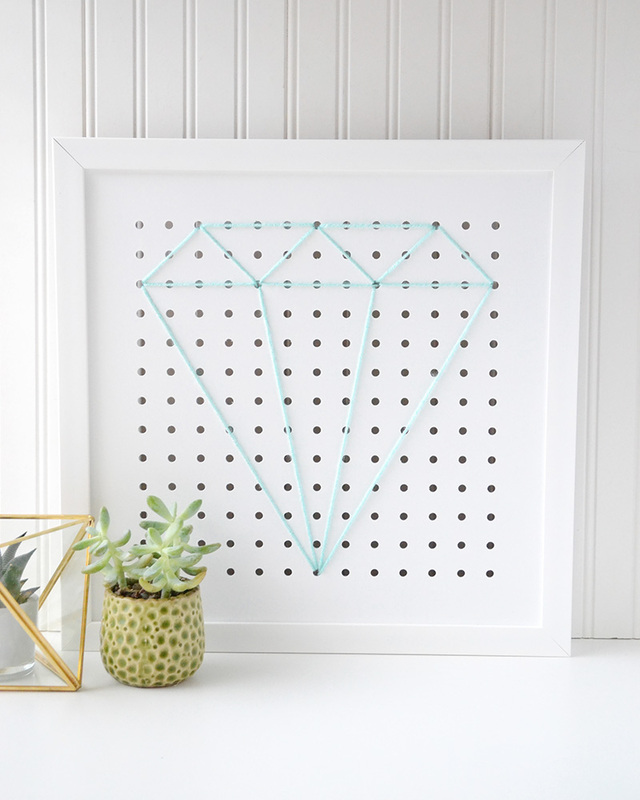 Once I removed the paper from the back of the frame, the back of the peg holes was accessible and I was able to "stitch" the yarn through the holes to create my diamond shape. I started by outlining the basic shape, feeding the end of the yarn through the holes. Tip: be careful where you thread the yarn on the back of the pegboard because it will show through the front. Try to keep the yarn on the back in the same place as the yarn on the front so it covers it up. Once I had outlined the basic diamond shape, I filled in some details on the inside, creating the facets of the diamond. To finish off the "stitching" I simply taped the two loose ends with masking tape on the back of the pegboard. I love how this turned out--the subtle aqua, the diamond trend, all mixed with the string art trend on a clean white canvas. Yum! And, to top it all off, it will be easy to change the string art when I decide I'm ready for something new. How cute would this be with seasonal shapes and colors?